Two days after a visit to the prolific urban river 15 miles to the north-east of my home, I was heading the same distance, but to the south-west to my syndicate held river for a comparison, a hot spring day, cooled by a strong breeze, giving way to perfect conditions for a memorable evening rise. The river level was down on last week, but plenty of oxygenating water still rushed over the stones. Swarms of black hawthorn flies drifting across the meadow, encouraged me to ignore the water’s edge and cut a diagonal directly to my intended starting point, at the confluence of a smaller stream on a bend of the river. In seasons past, this spot has held some of the better trout, but today the surface was untroubled by rising fish, despite the free offerings drifting downstream. To make a comparison with the urban river, my Black Devil nymph was tied on and prospected throughout the pool to no effect and I moved upstream, where the flow pushes over clean gravel runs. The only way to fish this section is in the water, searching out the deeper pockets, many trout lying hard under the banks. Getting down into the river, I made repeated casts along a deep run, increasing the range a yard at a time, bumping the nymph along the bottom, where it was seized with a jerk forward of the leader, the strike sending a powerful little wild brown cartwheeling across the surface, that ran full tilt past me, before being netted. 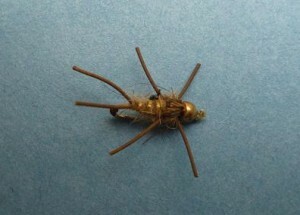 Only yards upstream a smaller brown darted from the cover of a weed clump to hook it’self in a boil of spray. The river was waking up. Pausing to look upstream, there was a rise, then another. Fish were mopping up the hawthorns, while grannoms and a few tan olives were lifting off. Nowhere near the activity of the urban river, but activity with a small “a”. Sticking with flies that have worked for me so far this year, the Black Devil came off and a Tan Emerger went on, the leader greased close to the hook, while the floatant was rubbed into the body of the fly for extra bouyancy in the riffle. This is a fast and furious form of flyfishing, casting and recasting to actual fish, or to likely looking holding areas, often takes coming out of the blue, the trout missing the fly as many times as I failed to make contact. Rises were increasing, but only three remained on the hook long enough to be swung in, and as they say, were mostly small stuff. 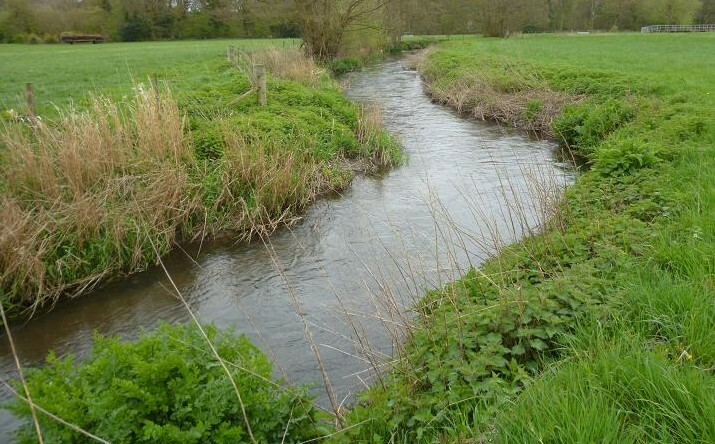 Above this fast flowing beat, the river slows over flatter ground and has become silted, changing it’s character and once again rising fish were absent, so I continued up to the next set of shallows, where once again there were the tell tale rings of rising fish. 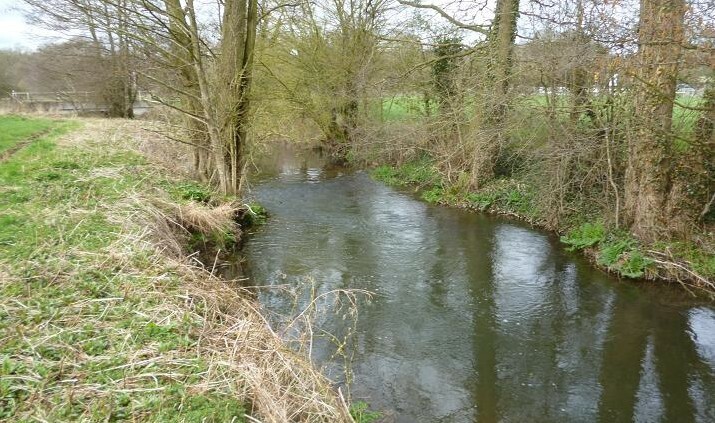 Back in the river, I waded within casting range of the slowly spreading rings, a fish obliging first cast, tumbling back toward me on the strike, confusing it’s silver flanks with those of a dace as it rolled on the surface. 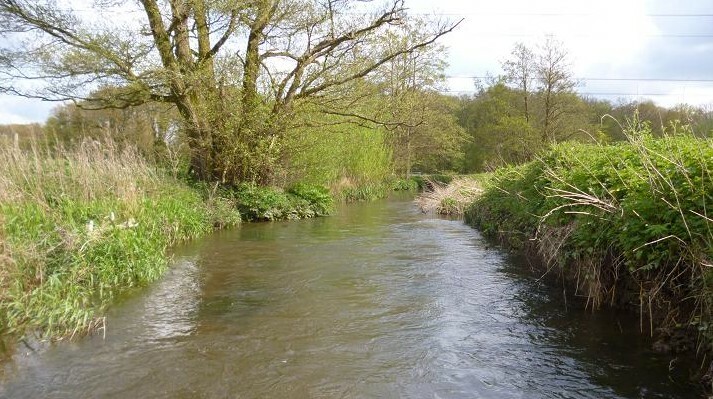 Another measured cast toward a dimpling rise did produce a dace, that caused as much commotion as the previous silver trout and once again confusion reined, until the fish was safely netted. Despite the disturbance, fish continued to rise and I took another three before I’d put them down, the best fighting all over the river like a rainbow before it slowed down enough to net. Further up at the mouth of the pool, I could see the steady rises from two larger fish and eased my way closer, but they had stopped once in casting range. I presented the emerger in all the likely places and up among the tree roots, but was unable to tempt anything into taking. 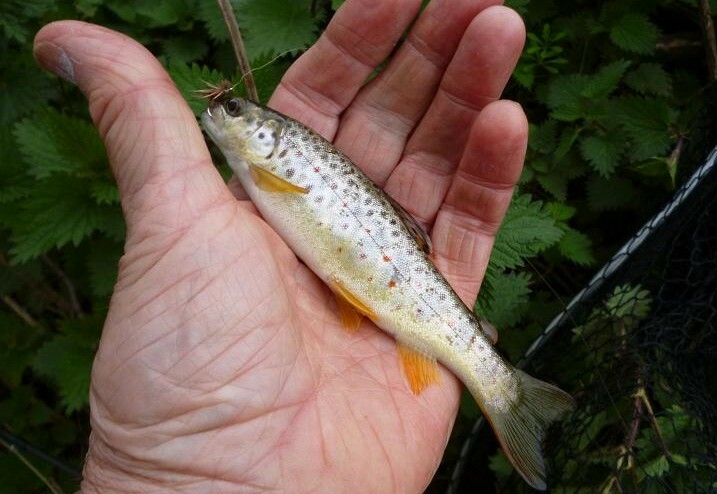 I considered changing to a Hares Ear nymph, or a shock tactic larger dry fly, but felt that I’d had a rewarding couple of hours and would leave these fish for other members to catch. Walking back, past another fast gravel run, fish were rising along it’s length, as eagerly as on the urban river and I could not resist a cast, or two, hooking another hard fighting silver brown from the middle of the river. I have yet to tempt the much larger trout to my offerings, but hope that as the season progresses, the mayfly will bring a few out of their hiding places. By now it was well past tea time, but at least I’d missed the queues of the rush hour and would have an easy drive home. 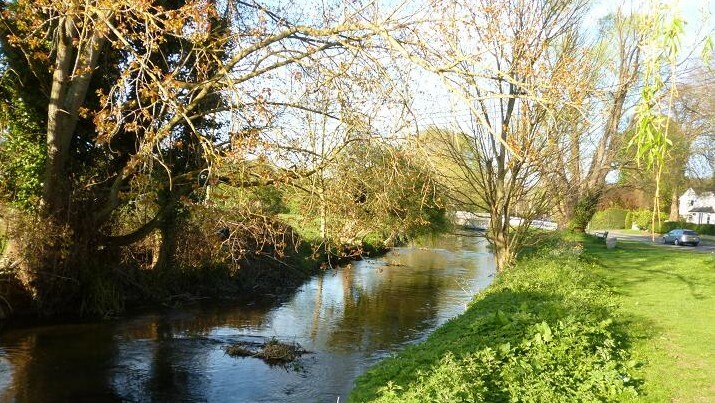 Following slow sport on my local Hampshire syndicate chalk stream, I fought through heavy rush hour traffic to see how an evening fishing for the wild trout on a true urban river would compare, parking the van in a residential street just after 6 pm. Walking down toward the river, I was met by a large banner asking to save the meadow which borders the stream, housing development being planned on the last strip of greenery along it’s length for miles, factories and housing already encroaching on it’s banks. Opposite the meadow, the river runs 10 yards from a busy road and pathway, which make casting difficult from the bank and I usually prefer to wade, but as this was a scouting mission intending to visit on another day, the waders stayed in the van, as did my 7 ft rod, bankside obstructions forcing the use of a nine footer. Walking to the lower end of the beat, several small trout were rising and I tied on a Tan Emerger. 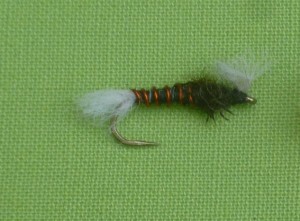 A gusting wind was blowing across the meadow, dragging the fly across the surface and on cue to change to a nymph, the fly snagged in the welcoming branches of a tree, which resulted in the tying in of a new tippet for the leader. My Black Devil nymph usually works well in bright sunshine, especially on this clear shallow river and punches into a head wind, as it carries a bit of weight, the leader greased to within the top two feet, keeping the fly close to the surface. Increasing the distance of my casts, up and across the flow, the leader darted forward from an upstream swirl and I was playing my first fish, that tumbled all over the surface, reaching out with my long handled net to lift it to the bank. This was the first of several wild browns hooked, some of which tumbled off, as I worked my way upstream, the surface coming alive with the sinking of the sun, although casting to these fish was a challenge, the bankside trees claiming more flies, testing my patience. The wind was still strong, so elected to remain on a nymph, but pinched some floatant grease into the body of a gold ribbed Hares Ear to allow it to fish in the surface film, deciding to walk further upstream, where the bank is clear and factories close to the bank would block the gusts, although with trees overhanging from the opposite side, casting is still a problem. Trout were rising in the gaps and I managed a few more, the best spending more time on the surface than below it, a beautifully marked fish. As I netted this wild brown trout, a car pulled up at the road side, the driver calling me over. This a common occurrence along this busy road, from drivers unaware of the fish this river holds. The conversation was no different this time, the highlight being that the driver was from Colorado in the US, working in the UK. Being a keen flyfisherman back home, he had not thought to bring his rods with him. With the light failing, I made my way back to the van, hoping that the next visit to the syndicate water would be as productive. 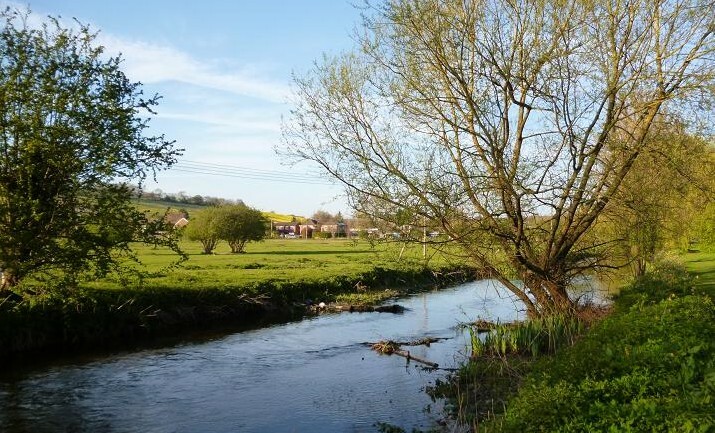 Warmed by spring sunshine, each visit to the river at this time of year reveals the rapid greening of the banks, while flylife increases daily and subtle changes in the river bottom create new fish holding areas, while old favourites lose their charm. A change of plans resulted in time for a late afternoon visit to my syndicate river this week, where I was hoping to find the trout had switched onto the fresh appearance of Hawthorn flies dancing on the breeze, but studying the surface, these black flies were being ignored as they drifted downstream. 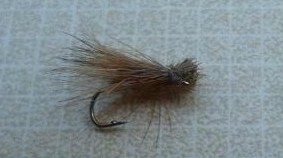 With a dry fly not an option, I tied on a tiny size 18 rubber legged Hares Ear, with a heavy gold rib and gold head, ideal for fishing under the banks and bushes, where the trout seem to be at the moment. Wading upstream, flicking the nymph just short of the undergrowth, there was soon a response and a small brown lifted out of the water in front of me, to fall off the hook seconds later. Further up, the force of the stream had hollowed out a deep pocket beneath a bush and I tried several casts to get the nymph to fall right without hooking the overhanging branches. More by luck than judgement, it curved round behind the bush, sinking into the pool and held. A downstream strike hit solid resistance, the rod bent round and stayed there. 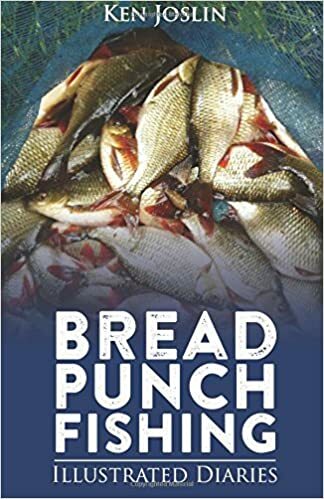 My heart slumped, then pumped as the line quivered, the suspected snag had come to life, a trout was shaking it’s head trying to lose the hook three feet below the surface. Seconds later the river erupted with the sight of the gold flanked brownie cartwheeling over the shallow gravel, when it burst out of it’s hideaway, big red spots clearly visible, as it powered past me searching for deeper water. My reel squealed, as the slack was taken up and I raised the rod to cushion the frenzied fight, watching it swim from left to right in the rapid flow, clearly visible, a deep trout about 15 inches long. Forgetting the small hook, I took up the fight and paid the price, when it shook free. We all know that hollow feeling, when a good fish is lost, something that doesn’t lessen with experience. That trout could have made my season. Back on the bank, I made my way downstream, meeting a pair of fellow members, who had finished for the day, telling me of small fish rising further down. I enjoy catching on the surface, whatever the size and true to their word, the river was dimpled by rises over a 20 yard stretch. Lowering myself in below them, I tied on a size 18 elk hair emerger and cast to the nearest beneath an over hanging tree. The fish were not maintaining station and the first fish hooked confirmed my hunch that they were a shoal of dace patrolling the tail of a deep pool. Beyond the shoal, a larger fish was rising steadily, probably a trout and I began to work my way toward it. At this point I turned to see a big cob swan was behind me, chasing the current love of his life upstream, the pen getting airborne with feet and wings flailing and stepped back to allow the pair to pass, watching them crash land at the head of the pool. This was the cue to make my way back to the van, but a noisy rise in a pool as I passed, caused me to back track. Wading upstream, the fish rose twice more just above the riffle, to what, I couldn’t see, but the small emerger was worth a try, measuring the distance, then moving up ten feet to make the cast. The air was still and the fly fell softly to the surface to be aggressively taken with a plop. A lift of the rod and I was in, the fish running forward to the safety of the pool, while I stripped back line, wading to the tail. 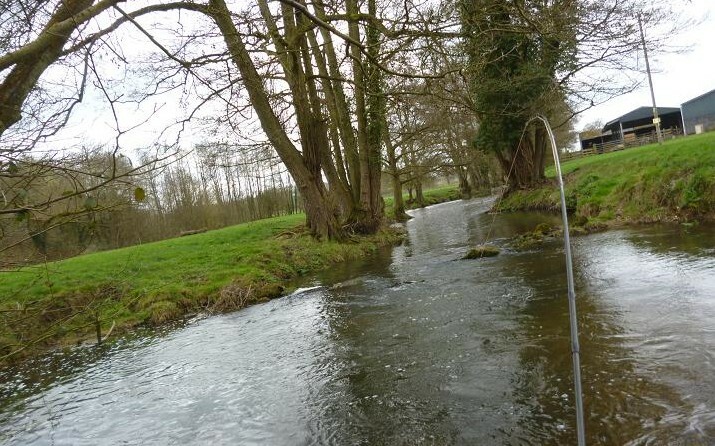 The fish remained deep, running round the pool, while I tried to steer it away from the bank side roots, a desperate leap finally confirming that I’d hooked a respectable trout, not ready to give up, until the last bit of energy had been expelled. With the earlier lost trout in mind, I took my time, letting it go, when it wanted to, netting it as it made a break for the shallows. Measuring 13 inches, this is my best trout from the river this year, which despite a prolonged fight, soon recovered, when held facing upstream, kicking free from my hands to swim back to the pool. 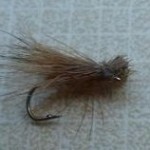 Small river brown trout begin to take the fly. Each new season brings out the optimism in flyfishermen, who rely on many natural factors coming together to provide their sport. 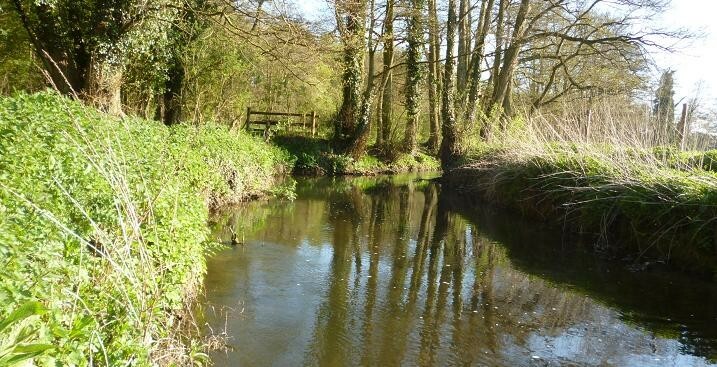 With a flood free winter, fingers are firmly crossed on my little syndicate chalk stream, for the warm weather to continue, awakening the trout, ready to feed on the nymphs as they rise from their gravel beds to hatch. 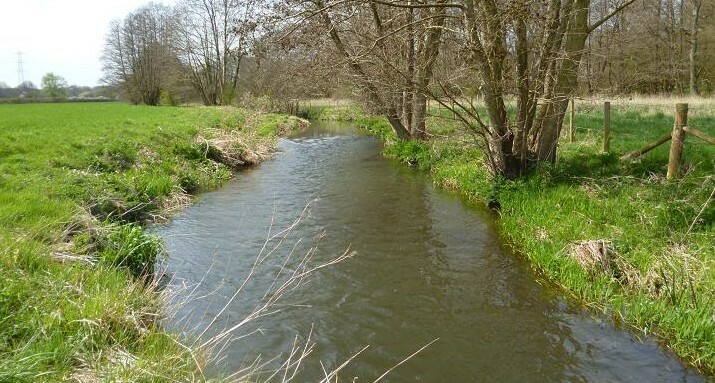 This is a favourite stretch of the river, where a cattle drink had created fishless shallows, but working alongside the farmer with fencing and the planting of a willow hedge by members, has resulted in a sharp turn, that runs deep along the willow. Having said all that, I have yet to catch a decent fish here, being the case again this week, when an hour spent wading, searching out the deeper pockets and runs with the Black Devil, resulted in a couple of dace and a 5 inch trout, with no rising fish seen. It is early days yet, the larger trout are yet to move out of their holes, down onto the gravel runs. Hope springs eternal! No excuses for another view of the river in early spring. 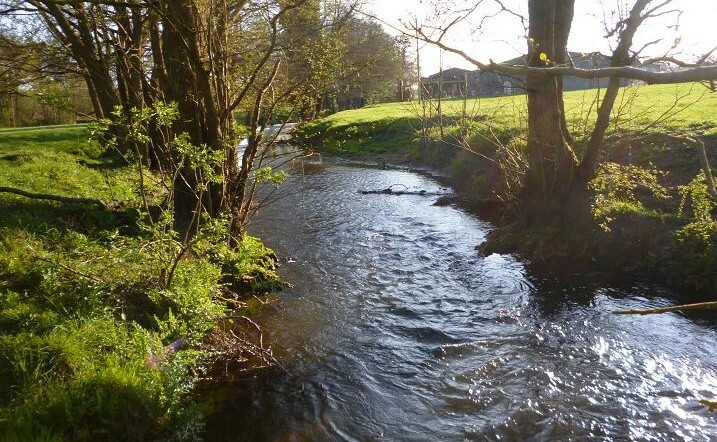 I retraced my steps, crossing the road down to the farm bridge, where a long deep pool always holds promise and I had caught rising dace the previous week. Peering into the pool as I passed, fish were dimpling the surface and climbed down into the water for a wade up to the tail. I couldn’t see what the fish were taking, they were even nudging the bubbles drifting down and with the Black Devil still attached, greased the leader close to the hook, to fish it near the surface, swirling and hooking a decent sized dace. Another dace and a few tweeks of the leader later, a better fish rose close to the bridge and I changed to a woolly nymph, that floats in the film like an emerger, and disappointingly, hooked another dace straight away. Making a longer cast to fall just under the opening, a fish torpedoed up to the surface and took the fly, exploding into action, dashing about the pool, leaping clear, even into the undergrowth at the edges, but eventually into my net. Not a monster, but 9 inches of wild beauty, this fish another example of the blue-silver strain of trout in the river. Returned, this brown swam away strongly with the minimum of revival time. False casting to dry off the nymph, it started to rain, getting heavier by the minute, something not forecast, wearing only a shirt under my waistcoat. Preparing to go, there was a dimpling rise to the right of the bridge and and I made a cast ahead of it, a pair of bubbles indicating, where the nymph had been sucked down, lifting into a solid fish that dived deep under the bridge. The fight continued around the pool, twisting and turning, back to the shallows at the tail, where still splashing, I raised it’s head for the net, to be surprised to see the white mouth of a chub, that had fought as hard as any trout of it’s size. Fat with spawn, this chub showed evidence of a painful past, having encountered a heron, mink, or a pike and recovered. The rain persisted, stopping play, cutting short, what was turning into an interesting session. Whatever the weather, I was determined to fish my local syndicate trout stream on opening day, having spent the previous week in preparation and anticipation of the day, but I needn’t have worried, by lunch time the damp start had given way to weak sunshine and I arrived to the sound of a blackbird singing, while a woodpecker drummed away in the distant woods. The river was low and clear, despite the rains of late. I did not expect to see any rising fish so early in the year and tied on my Black Devil nymph, which has proved a successful season opener for me on so many occasions, it’s copper windings allowing it to fish near the bottom, where it may be mistaken for a caddis. Whatever it looks like to the fish it doesn’t matter, because third cast in along the bank, the leader shot forward and I was playing my first trout of the 2015 season, a pristine, perfect brown of about ten inches long, that dashed around the river, leaping clear of the surface twice, before sliding over the net. This picture does not do the trout justice, it’s red spots standing out bright against the green bronze of it’s body. The Black Devil is firmly in the scissors of it’s jaw, the barbless hook slipping out easily and the brownie returned in seconds. My aim was to walk down to to where a smaller river joins, but could not resist a few casts at a cattle drink on the way down, but found it occupied by a big cob swan, that puffed it’self up, cruising up and down, claiming it’s territory. I was in no hurry to fish this spot and continued down and saw a fish rise in a channel of the gravel run off from the cattle drink. There were a few tan olives lifting off, but waded in to cast the Black Devil up to the riffle, seeing the rise again and casting well above it. There was a boil and the line darted forward as a small dace took the fly to tumble of the hook at my feet. Next stop was at a small broken down weir, where the river creates a variety of small pools and runs. Wading out to the middle of the tail, I was able to cover most of the area, casting up under the lip, letting the nymph drift across fast and slack water. Watching the line, as it made it’s way past the resident tree, it arced upstream and I was into a better fish, that burst out of the river in a tail walking spray, frantically traversing the pool from side to side, until as often happens on this shallow river, it bow waved past me to the run below, creating a slack line, which made full contact again with another shower of spray. The hook held and the trout began a zig-zag fight back to me, to lie on it’s side at my feet, a photo opportunity. While lining up the camera with my left hand, the trout got second wind, running up stream again and I snatched a shot. Lesson learned, I stuffed the camera back in my pocket and brought the brownie back under control, waiting for it to stop powering away upstream, allowing the 12 oz trout to drift back to my net. This was another fin perfect brown trout, these silver flanked fish a common variation on the Hampshire chalk stream. 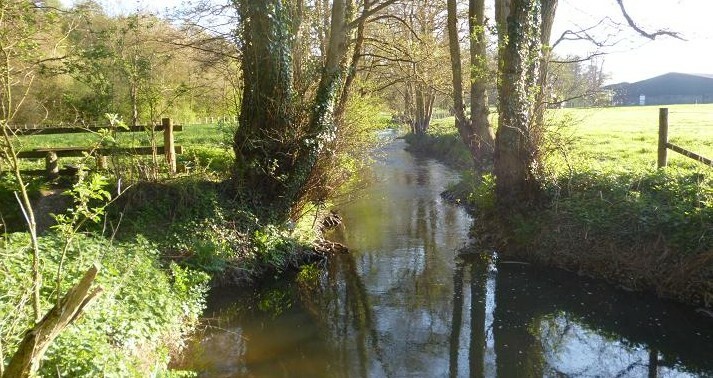 I now made the five hundred yard walk down to where the feeder stream comes in, noting it’s coloured water being pushed to the far side by the clear flow from our river, the eddies and slacks looking like they held many trout, but the Black Devil was ignored, until a cast up and along the far bank in the dirty water, saw the line dart to one side. I was in again, the gold flash of another brown through the mirk indicated a 6 oz fish, which spiralled round then came of as it dropped back downstream. Already satisfied with my afternoon, I made my way back, taking occasional casts from the bank, missing a few lightning takes, which I put down to dace, but also failing to get any response from a few of the deeper banker pools, putting on a heavier Gold Head Hares Ear at the last in an attempt to change my luck, but nothing. Not far from the van, I spotted fish rising below the farm bridge and back tracked to get down into the river, wading up within casting distance of the rises and dropped the nymph in among them. It was taken on the drop, but I missed. The next cast must have dropped on it’s nose, as a bulge on the surface resulted in a hooked fish, a small dace. There were still rises below the bridge, all dace, two more hooked and one dropped called an end to it and my afternoon’s fishing. This is just the start of a what I hope will be a good season, the previous two were dogged by floods, but the two trout taken today were already plump, well mended fish.